Welcome to the family, Max! Max has a lot going on within just his first night at his new foster family’s home. He gets to meet all of his new siblings and before he knows it, he wakes up with the surprise of a lifetime! Max, along with his foster siblings, Tess, Anika, Sal and Daniel suddenly find out that their foster parents are missing. What can they do now?! These siblings join together and take things into their own hands to find their foster parents and bring their family all together again. It’s a show filled with mystery, adventure, and not like any other show that has aired on Nickelodeon before. Get ready for one exciting journey with Nickelodeon’s all new, masterpiece of a show, Hunter Street premiering on March 13th at 7:00 PM ET / PT. It’s time to crack the mystery as these amazing siblings do whatever it takes to find their foster parents – even if that means having to boat race through canals, fight off family rivals, and more. There will be challenges at every turn for the siblings to face. Max, Tess, Anika, Sal and Daniel all have different personalities and unique traits that will help the family get to the bottom of this mystery. Tess stands out as the independent sister and Anika’s fun-loving and vibrant personality is hard to miss. Sal’s brains and genius thinking will definitely help the siblings through all situations, while Daniel, the eldest brother, will protect the group. With Max’s street smart skills, we all will have to tune in to see the Hunter siblings take on any obstacles that may come their way. The exceptional show is certainly bound to be a fan-favorite and you’re definitely going to be glued to your TV screens with all of the unforgettable moments and eye-opening scenes. Hunter Street stars an immensely talented cast comprising of Stony Blyden as Max, MaeMae Renfrow, who takes on the role of Tess, Kyra Smith as Anika, Daan Creyghton who plays the role of Sal, and Thomas Jansen portraying the role of Daniel. I, Alexisjoyvipaccess had the greatest honor of covering the 2017 Nickelodeon Kids’ Choice Awards press junket and had a phenomenal time interviewing Hunter Street stars, Stony Blyden and MaeMae Renfrow at the event. 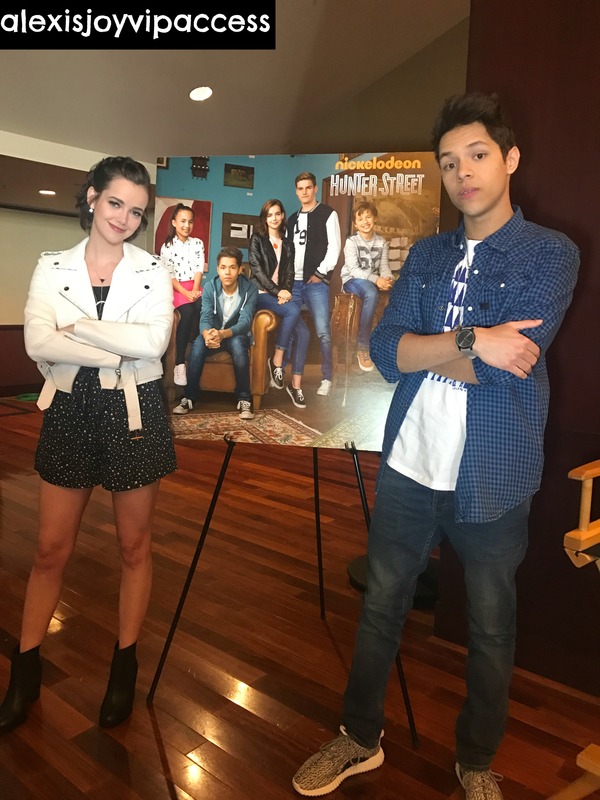 Stony Blyden and MaeMae Renfrow dished exclusively to Alexisjoyvipaccess all about what it was like filming Hunter Street in Amsterdam, what is one thing they would like to keep from the Hunter Street set, and so much more only in our VIPAccessEXCLUSIVE interview. MaeMae Renfrow and Stony Blyden even took on a fun speed round and revealed who they would slime or save – find out their answers in our VIPAccessEXCLUSIVE interview below! Thanks for the fun interview, Stony and MaeMae! Check out my VIPAccessEXCLUSIVE interview with Hunter Street stars Stony Blyden and MaeMae Renfrow at the 2017 Nickelodeon Kids’ Choice Awards press junket below! Don’t forget to tune in to see Hunter Street premiering on Nickelodeon on March 13th at 7:00 PM ET/ PT with a special sneak peek of the show right after the KCAs! For more info on Hunter Street, visit Nick.com/HunterStreet! Previous Article: Are You Ready For Some Slimetastic Fun? Nickelodeon’s SlimeFest Is Coming To The US Next Year! Next VIPAccessEXCLUSIVE: Alexisjoyvipaccess 2017 Nickelodeon Kids’ Choice Awards Seating Card Tour With JoJo Siwa!